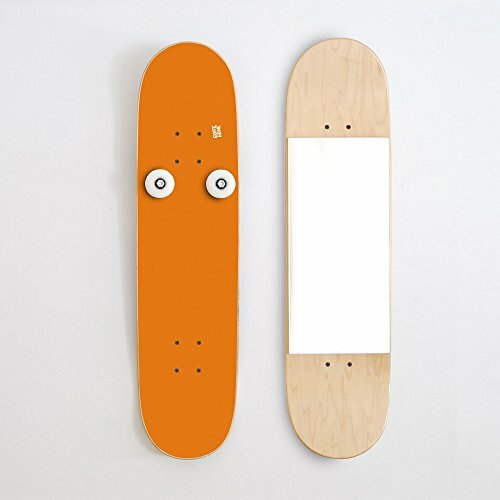 Vertical coat rack on skateboard deck and skate mirror perfect for the decoration of your house. This set of decoration with skateboard at the entrance of the house or on the walls of your room will impress all your friends and family. If you want to get the most out of decorating your home, then this is your set. Take this vertical rack and mirror to reflect your favorite sport in the decoration of your walls. A very useful set to hang your jacket or backpack when you come to class and a mirror to give you that last touch before leaving home. Also if you are thinking of giving a skateboarder a gift, this set of vertical rack and mirror is a gift that you will surely like. Skateboard Mirror and coat rack made with original skateboard made of 7 sheets of the best Canadian maple wood, with concave shape and hangers formed by 2 skate wheels. Mirror with natural varnished finish. The backpack is not included. DIMENSIONS: L 32" H 8" W 3.54"
If you have any questions about this product by SKATE-HOME, contact us by completing and submitting the form below. If you are looking for a specif part number, please include it with your message.